Submissions will be sent to two referees for assessment, following a blind peer-review policy. In case of disagreement, a third report will be decisive. If the paper is accepted for publication, the authors may be asked to consider the suggestions made by the referees and to bring it into line with our style sheet. The contributions, in its final form, will then go through copyediting, layout, and proofreading. 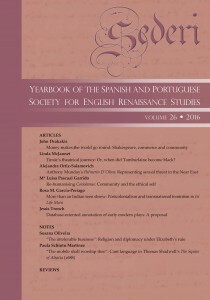 Once published, the authors will receive a copy of the issue in which their work is included. Relation to SEDERI areas of interest. Originality and interest of the topic in relation to current research. Use of concepts and methods of analysis. Interest of data analysed, results obtained and conclusions reached. Depth of discussion of issues, problems and theoretical concerns. Coherence and cohesion in the thread of argument and structure. Clarity, conciseness and command of the language. Knowledge and review of bibliographical references and sources. Engagement with and discussion of other studies on the topic. Title: its adequacy, clarity and informative quality. Only original research is published by SEDERI. Therefore, we do not consider research pieces that have been published elsewhere (either in print or online) or are under simultaneous consideration with another publisher; translations are not considered either. Authors will be asked to sign a declaration stating that their contributions have not been previously published, in whole or in part, and do not infringe the copyright or property right of another journal, author or publisher. Permission for publication of copyrighted material (pictures, photographs, etc.) should be obtained by the author. The copyright holder of the published contributions is SEDERI. The hardcopy and an open-access version of the journal will be published simultaneously. The issues will be available online in the SEDERI website (www.sederi.org/yearbooks.htm) and other repositories that have signed an agreement with SEDERI. Those authors who wish to republish or rewrite their contributions for another journal/book or include the published article in their personal repositories should contact the editors to obtain permission to do so. This will entail citing SEDERI as the original source and sending the editors a copy of the new version. 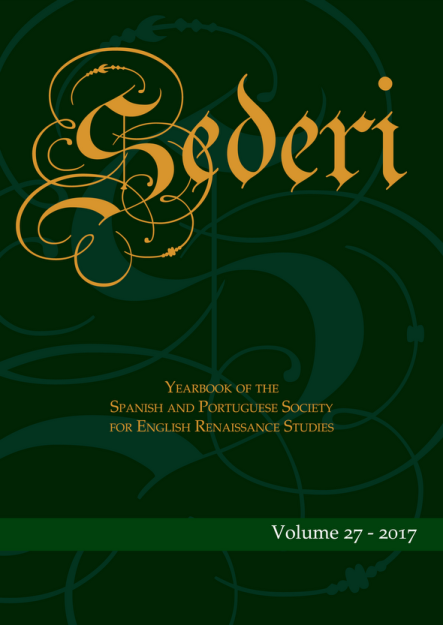 SEDERI publishes scholarly research pieces, which will be available both in print and online. These will be Open Access, in the spirit of sharing knowledge. Remember, however, that the journal is copyrighted, and therefore any kind of usage of SEDERI material must give credit to the journal by citing the authorship and full publication details. The usage of SEDERI material for commercial purposes is not allowed without the journal’s permission.